I felt that the best way for me to make new gains without changing my diet too drastically or in an unsustainable fashion, would be to simply add high quality weight gain supplements? Here?s my Serious Mass review. Look at the total number of calories per dollar in a weight gainer. Serious Mass mixed best with fruit, milk & orange juice in a blender. I give this product at overall grade of A+. Many will state that bodybuilding is extremely difficult due to the intensity of training required to make gains. To me, this has always been the easiest part of bodybuilding since I happen to love working out and therefore it is not something I consider to be hard. I find it to be more fun and fulfilling than anything. 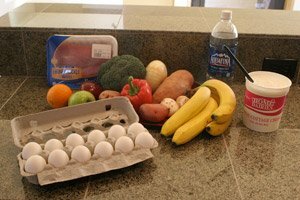 The nutrition aspect of bodybuilding is far more significant in my opinion and also far more difficult due to the fact that I have such a small appetite and can never consume the requisite amount of calories needed to sustain muscle development or even maintain my current levels of mass for that matter! Finally I decided that the best way for me to consume more calories would be to eat the same diet that I already have and throw in some weight gain products in the mix, since the high calorie shakes can potentially give me the boost that I need to begin new growth. Optimum Nutrition is a fantastic supplement. Their whey protein truly is perfected in my opinion. I can literally say nothing bad about it whatsoever. It delivers exactly what the bodybuilding advocate will want in a protein powder in terms of nutrient, taste, and value for the price. Optimum 100% Whey Protein won the Supplement Of The Year and Protein Powder Of The Year award for 2005, 2006 and 2007! Since the very beginning, Optimum Nutrition has raised the standard by which all other whey protein supplements are judged. Being such a huge fan of Optimum's whey protein, I figured that I couldn't go wrong in purchasing their Serious Mass. Since they have already mastered the art of protein powder, I felt that mastering the art of weight gain powder would not be that much harder to do and something that they would be qualified for. That having been said, I felt that the best way for me to make new gains without changing my diet too drastically or in an unsustainable fashion, would be to simply add high quality weight gain supplements to my diet in addition to my regular meals. I find it far easier to drink calories than to eat them. Enough Calories From Food Alone. Also, the company is top of the line and they have protein powder production down to an exact science... almost. As it is, I consider their whey protein to be incredible in all aspects in which a protein product should be - taste, quality, and overall value to the consumer. That said, I felt that there is no better company to produce a high quality weight gain powder and decided to give their "Serious Mass" a try. Some weight gain powders claim that they contain a great deal of calories per serving, but you must also look at the number of servings per container to determine the value (calories/dollar) as I demonstrated above. For example, a serving for Optimum's Serious Mass is considered to be two heaping scoops (334 grams). Since 2565 is enough to feed an adult male for a day and for the low price of $5, you can see that Serious Mass is a pretty good deal - that is, if you don't mind drinking shakes for your meals, as some people do not, especially those disciplined in their diets such as myself. Of course I would not suggest eating such a boring diet since a little variety is sometimes greatly beneficial to a person's psychological health and well being. That said, I am merely trying to prove the point that Optimum Nutrition delivers good value for the price. 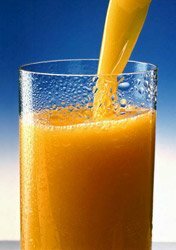 If you drink the shakes using milk or juice and also fruit, even more calories will be present. Of course, you do not use to use a full serving for every shake, nor do you need to consume the recommended three servings per day. If you were to do so, your entire 12 pound tub of Serious Mass would not even last you a week. [ Click here to learn more. ] Weight Gainers & Whey! While I have great respect for Optimum Nutrition, every company wants you to consume their products, so it doesn't surprise me that they recommend so many daily shakes. Ultimately, it is your choice how many Serious Mass shakes you consume each day and how large each shake is. It is always important to look at the ingredients for each supplement in order to determine whether or not you would like to include it in your diet. If you are one of those people who just can't gain weight, try a weight gainer to add extra calories to your daily diet. These are some of the items which I look for even more than the basic caloric breakdown of protein, carbs, and fat. There is no aspartame in Serious Mass, which is very important to me, but I find it somewhat annoying to have to individually research each and every chemical they list above, and I hope that supplement manufacturer's and especially a company as premium level as Optimum would be cognizant of the fact that people in general, and health enthusiasts in particular, do not wish to consume supplements loaded with harmful chemicals, or chemicals where very little research is available for. Aspartame is the name for an artificial, non-saccharide sweetener, aspartyl-phenylalanine-1-methyl ester. It is an ingredient of approximately 6,000 consumer foods and beverages sold worldwide. It is commonly used in diet soft drinks, and is often provided as a table condiment. I cannot speak for the list of other ingredients above and I am currently in the process of seeking peer reviewed literature on their effects. I can hope that Optimum is as responsible as I believe they are, and since their products do not contain aspartame, I am pleased thus far with that knowledge. Blended in a blender with bananas, pineapples, strawberries, milk, and orange juice. I found that it mixed perfectly well and I definitely enjoyed this shake! It was like drinking a full meal and I thought it was outstanding quality with no problems mixing. Serious Mass Mixed Perfectly With Orange Juice. Mixed in a glass with water. I found that it did not mix particularly well in water when stirred with a spoon. It was very clumpy and I almost felt as though I was eating it rather than drinking it. That didn't bother me, since I just wanted the calories, but for those who like taste and consistency, I would not recommend consuming your Serious Mass shakes like this. Mixed in a glass with milk. This was a little better than mixing it with water in that it definitely tasted better, but was still not an easy mixture in my opinion and did clump up a fair amount. I would not recommend this either for most who care about these types of things. As I said, I just wanted the calories, so it didn't really bother me much. [ Click here to learn more. ] Optimum Serious Mass Review: Weight Gainer For Muscle Building! Serious Mass: the ultimate in weight-gain formulas. It supplies you with the tools you need to pack on the pounds and develop the physique... Learn more. Preparing my serious mass shakes as described above, they tasted great. They didn't seem like health food and were easy to drink, giving me the extra boost in calories I needed to make more gains. I try to be moderate in what I do, and even while bulking, I maintain a relatively moderate intake of calories, and it was not hard to get those calories in with Serious Mass shakes which I found to be quite delicious. [ Click To Join The Thread. ] Best Tasting Gainer? I really like the muscle milk peanut butter chocolate. Any have some input on a really good tasting weight gainer? In milk, they were quite tolerable, but in water, I didn't much care for the taste. I would definitely recommend consuming these shakes with fruits mixed in, or other items such as juice or yogurt, to make them taste good. If not, they are a little bland and not great to drink, although they still have the calories I'm looking for which is the number one thing to me. 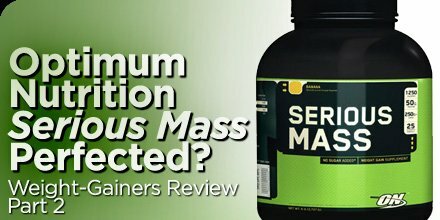 Serious Mass by Optimum has the fortune of being the first weight gain supplement that I have reviewed so far this year with many more left to go. As a result, I don't have much to compare it to other than weight gain supplements which I have reviewed a long time ago and therefore consider it to be very high quality but do not know exactly how it will compare to the other supplements which I will be reviewing very soon. That said, based on my use, and based on the numerous ways in which I consumed my Serious Mass shakes, I would have to grade it a definite A+, and an outstanding product from a great company. [ Click here to learn more. ] Mass Gainers That Work! The following is an independent product review of Dymatize Mega Gainer and SportPharma Gainer Whey Protein. I should also point out that I am not at all surprised that this is the case and I have come to expect no less from them since they have seriously developed protein and weight gain powders perfectly! I look forward to trying all of their other products and I am compelled to believe that all of their lineup will be just as good!